Greg Berlin, Jake Lipsett, and Charles Starnes, all former digital fundraising specialists for the DCCC, founded Mothership Strategies, a Washington, D.C., based progressive digital firm that specializes in online fundraising, digital advertising, and grassroots advocacy. The group boasts of their assistance of the Ossoff campaign on their website. "Mothership Strategies is proud to be on Team Ossoff, working to flip Georgia's 6th Congressional District from Red to Blue for the first time in decades," the website reads. "The movement that's happening on the ground in Georgia has led to some of the most impressive grassroots support we've seen—ever." Mothership Strategies received $3.9 million in payments from the Ossoff campaign for online fundraising consulting, advertisement production, and media buys, filings show. The amount that Mothership received from Ossoff's campaign was more than Republican Karen Handel's campaign spent during the entire special election. 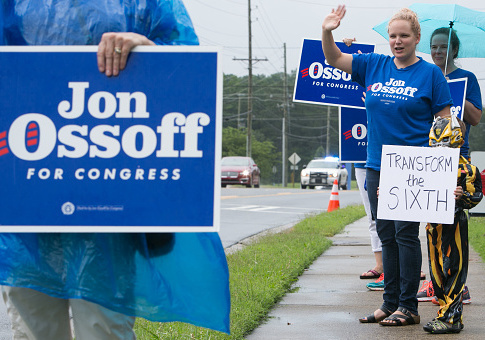 Handel, who defeated Ossoff by nearly five percentage points, raised $4.5 million and reported spending $3.2 million throughout the course of the election, an amount that is $700,000 less than what Mothership was paid by Ossoff. Some who were familiar with Mothership's connection to Ossoff campaign took to social media to express their displeasure with the alleged work of the group. Tonight, @teammothership needs to apologize to the resistance and either shut down or never use the #ga06 email program again. Mothership was also paid $310,793 for their help on the failed special election campaign of Montana Democrat Rob Quist, records show. The firm did not return a request for comment by press time. Georgia's special election was the most expensive U.S. House race in history, shattering a record that was previously held by the 2012 Florida race between Democrat Patrick Erin Murphy and Republican Allen West. That race had $29.5 million in total spending. Georgia's special election ultimately surpassed $50 million in total expenditures. Ossoff's campaign expenditures and help from outside groups surpassed $30 million. Handel's just over $20 million. This entry was posted in Politics and tagged DCCC, Democrats, Jon Ossoff. Bookmark the permalink.